with the controls and the proper use of the machine. Please keep the instructions safe for later use! through foreign objects thrown from the machine. blade(s). Beware of severing toes or fingers. off, a rotating blade can cause injury. Do not use the machine in the rain or leave it outdoors when it is raining. machine out of reach of children. of the machine by a person responsible for their safety.  The operator or user is responsible for accidents or hazards occurring to other people or their property.  Mow only in daylight or in good artificial light.  Avoid operating the machine in wet grass, where feasible. and/or grass catchers in place.  Working on banks can be dangerous. – Always be sure of your footing on slopes or wet grass. – Use extreme caution when stepping back or pulling the machine towards you. well away from rotating parts.  Do not put hands or feet near or under rotating parts.  Never pick up or carry the machine while the motor is running. lead to contact with live parts. Beware electric shock hazard. to the voltage of the power source. be actuated by a 30 mA residual current. correspond to the types indicated by the manufacturer. See the operating instructions for the order no. and types.  Never touch the mains plug with wet hands.  Do not run over, crush or pull the power supply cable or extension lead, otherwise it may be damaged. Protect the cable from heat, oil and sharp edges. adjusting, cleaning or if cable is cut, damaged or entangled.  Caution – do not touch the rotating blade. approved extension cables. Contact your Bosch Service Centre for details. Note: If an extension cable is used it must be earthed and connected through the plug to the earth cable of your supply network in accordance with prescribed safety regulations. watertight construction and intended for outdoor use. Cable connections should be kept dry and off the ground. WARNING: For your safety, it is required that the plug attached to the machine is connected with the extension cord. extension cord must be used with a cable strain relief. regular intervals and may only be used if in perfect condition. have the same fuse rating as the original plug. shock hazard and should never be inserted into a mains socket elsewhere. Products sold in AUS and NZ only: Use a residual current device (RCD) with a rated residual current of 30 mA or less.  Always wear gardening gloves when handling or working near the sharp blades.  Keep all nuts, bolts and screws tight to be sure that the machine is in safe working condition.  Check the grass catcher frequently for wear or deterioration. 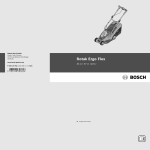  Ensure replacement parts fitted are Bosch approved. 2000/14/EC: Guaranteed sound power level 94 dB(A). Conformity assessment procedure according to Annex VI. The garden product is intended for domestic lawn mowing. Sound pressure level 79 dB(A); sound power level 93 dB(A). ah <2.5 m/s2, K =1.5 m/s2.